Ned Sublette was one of the most unclassifiable talents in the late-twentieth-century New York music scene--quite a statement, considering that New York new music specializes in unclassifiable talents. Ned Sublette's forte is the unlikely combination of Cuban and country styles. Better known as a singer-songwriter (his 1999 Palm Pictures album Cowboy Rumba reached #1 on the World Music Charts Europe), Ned Sublette (b. 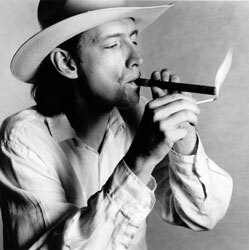 1951, Texas) went to Cuba in January 1990 to explore the then-unknown (in the U.S.) music scene there. Like many people who go to Cuba, he found it a life-changing experience. "My life is divided into before and after that first trip to Cuba," he says. 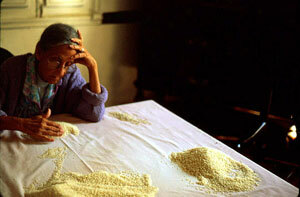 Ned Sublette, Josefina Picks Stones out of Rice, Vedado, Color Photograph, 16" x 20"
From the beginning of his travels in Cuba Ned Sublette carried a camera, and found himself drawn into studying the technique of photography out of his desire to hold onto moments he was living. "I was writing songs about my experiences," Ned Sublette said. 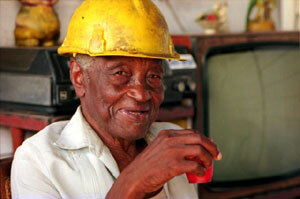 "But the pictures I was snapping were a different and more immediate way of capturing my experience in Cuba. They started to mean more and more to me, and I had to know how to make them better." As his technique and equipment became more sophisticated, Ned Sublette's pictures started being used on album covers and appearing in publications including The New York Times and The Miami Herald. "With every trip I took, the camera became a more important part of the experience. At some point the need to make the pictures came to dominate my travels. Cuba made me into a photographer." Ned Sublette, Elegguá, Color Photograph, 11" x 14"
These pictures are unposed moments, stolen out of days and nights in Havana, Matanzas and Cienfuegos, emphasizing motion. 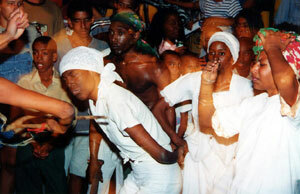 Among the sets of images contained in the show are: Cubans at work; dancers embodying the orishas of the religion known as lucumí, or santería; Havana's streets by night; and a selection from Ned Sublette's years of photographing dancers at La Tropical, Havana's legendary open-air dancehall. 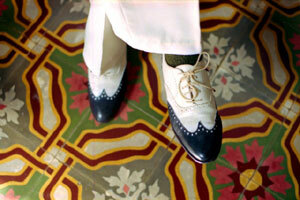 Ned Sublette, Ricardo Cane's Shoes, Matanzaz, Color Photograph, 16" x 20"
Ned Sublette was for several years co-producer of the public radio program Afropop Worldwide; in the early 1990s he pioneered the marketing of Cuban music in the U.S. with his record label Qbadisc. Besides overseeing 30 CD releases on Qbadisc, Ned Sublette co-produced compilations of Cuban music for World Pacific and Luaka Bop Records (including 1991's Dancing with the Enemy). Ned Sublette was contracted under A Cappella, an imprint of the Chicago Review Press, to deliver a book published in 2004, Cuba and Its Music: From the First Drums to the Mambo. 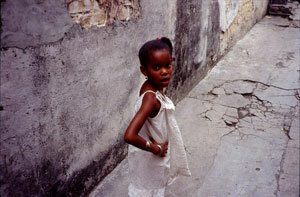 Ned Sublette, Girl, Luyano, Color Photograph, 11" x 14"
Ned Sublette's photographs have been published in numerous newspapers, magazines and CD packages. 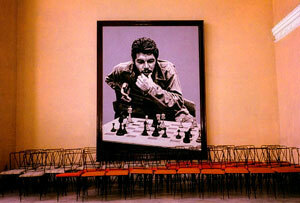 En Cuba aprendí a ver (In Cuba I Learned to See) was his first solo photo exhibition held at Medicine Man Gallery in 2001. This exhibition gathered photographs taken by Ned Sublette during his years of traveling in Cuba, and allows the viewer to see the complicated -- and frequently encoded -- reality of the country through the eyes of an artist who has gone deeply beneath its surface. 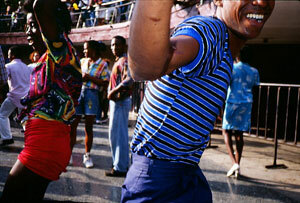 Ned Sublette's photos emphasize rhythm, motion, color and above all, human contact. Ned Sublette, Woman at Sewing Machine, Mariano, Color Photograph, 16" x 20"
Ned Sublette is a classically trained guitarist, and studied composition with Kenneth Gaburo at the University of California, San Diego. He grew up in Portales, New Mexico, moved to New York City in 1976, and has worked with John Cage, LaMonte Young, Glenn Branca, and Peter Gordon. Ned Sublette, Dancing Couple, Color Photograph, 11" x 14"
During the nineteen eighties, he led the Ned Sublette Band, which played country with Cuban stylings. In 2006, Willie Nelson released Ned Sublette's song "Cowboys Are Frequently, Secretly Fond of Each Other" in the wake of the success of the film, Brokeback Mountain. Ned Sublette is a 2005 Guggenheim Fellow. Ned Sublette, Che Plays Chess, Matazas, Color Photograph, 11" x 14"
1982 - Cowboys Are Frequently Secretly/ in "Life is a Killer"
Ned Sublette, Hard Hat Worker on Coffee Break, Jovellanos, Color Photograph, 11" x 14"